American, British, Canadian, Australian and New Zealand Armies' Program (ABCA) - Optimizing ABCA Armies' interoperability in order to deliver success on coalition operations. Addresses current tactical and operational interoperability level issues within the context of contemporary joint full spectrum operations. Army National Guard - Component of the Army (which consists of the Active Army, Army National Guard, and Army Reserves). The Army National Guard is composed primarily of traditional Guardsmen - civilians who serve their country, state and community on a part-time basis. British Army (UK) - Official UK site. California National Guard - Official site. Commander Naval Special Warfare Command - Official site of the Navy component to the United States Special Operations Command News and information. Defense Advanced Research Projects Agency (DARPA) - Central research and development organization for the Department of Defense (DoD). Defense Intelligence Agency (DIA) - With over 7000 military and civilian employees worldwide, DIA is a major producer and manager of foreign military intelligence. Defense Threat Reduction Agency (DTRA) - Focuses on keeping WMD out of the hands of terrorists and other enemies by locking down, monitoring, and destroying weapons and weapons related materials. Assists Combatant Commanders with plans and responses to WMD events. Develops and delivers technologies to assist with these endeavors. Department of Defense (DoD) Unified Command Plan - Establishes the missions and geographic responsibilities among the combatant commanders. Explosive Ordnance Disposal Group 1 - Technicians render safe all types of ordnance, including improvised, chemical, biological, and nuclear. They perform land and underwater location, identification, render-safe, and recovery (or disposal) of foreign and domestic ordnance. They conduct demolition of hazardous munitions, pyrotechnics, and retrograde explosives using detonation and burning techniques. Global U.S. Troop Deployment, 1950-2003 - A comprehensive dataset prepared by Tim Kane, PhD. for the Heritage Foundation. Indian Armed Forces: Bharat Rakshak - Consortium of Indian military websites. Information Awareness Office (IAO) - Established by the Defense Advanced Research Projects Agency (DARPA) in January 2002 to bring together several DARPA projects focused on applying surveillance and information technology to track and monitor terrorists and other asymmetric threats to U.S. national security, by achieving Total Information Awareness (TIA). International Security Assistance Force (ISAF) - The role of ISAF, a NATO force mandated by the UN, is to assist in the maintenance of security to help the Afghan Transitional Authority and the UN in Kabul and its environs. Israeli Defense Forces (IDF) - Official Israeli page. J7 Joint Experimentation, Transformation, and Concepts Division (JETCD) [Future Joint Warfare] - Supports and facilitates the transformation efforts of the Chairman of the Joint Chiefs of Staff. Develops the Capstone Concept for Joint Operations (CCJO) and integrates subordinate Joint Operating Concepts, Joint Functional Concepts, and Joint Integrating Concepts. The division ensures that this family of joint concepts, known as the Joint Operations Concepts (JOpsC) family, is properly represented in guidance and planning documents, such as the Quadrennial Defense Review, Strategic Planning Guidance, Military Strategy, Service Transformation Roadmaps, and Service Concepts. JETCD is the Joint Staff lead for joint experimentation. Japan Maritime Self-Defense Force (JMSDF) - The de facto navy of Japan. Its main tasks are to maintain control of the nation's sea lanes and to patrol territorial waters. It also participates in UN-led peacekeeping operations (PKOs) and Maritime Interdiction Operations (MIOs). Also see Wikipedia. Military Sealift Command (MSC) - MSC is a U.S. Navy command and is one of three component commands reporting to the joint service U.S. Transportation Command, known as USTRANSCOM. Ministry of Defense, UK - Governmentlal security and defence organization of the United Kingdom. Missile Defense Agency (MDA) - Mission is to develop, test, and field an integrated, layered, ballistic missile defense system (BMDS) to defend the United States, its deployed forces, allies, and friends against all ranges of enemy ballistic missiles in all phases of flight. National Geospatial-Intelligence Agency - Provides imagery, geospatial and targeting analysis, along with image sciences and modeling for U.S. national defense, disaster relief and safety of navigation. Naval Safety Center - Provides safety assistance and advice to the CNO, CMC, and the Deputy Assistant SECNAV for Safety in order to enhance the warfighting capability of the Navy and Marine Corps, preserve resources and improve combat readiness by preventing mishaps and saving lives. 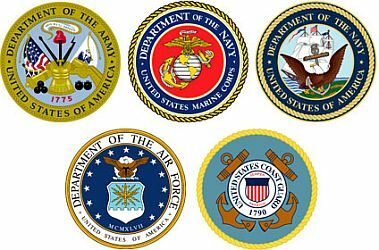 New York State Division of Military and Naval Affairs (DMNA) - DMNA is a state agency that serves as the headquarters for New York's militia forces (the Army National Guard, the Air National Guard, the New York Guard and the New York Naval Militia). In addition, it performs federal functions required to support the Army and Air National Guard. North American Aerospace Defense Command (NORAD) - A binational United States and Canadian organization charged with the missions of aerospace warning and aerospace control for North America. Aerospace warning includes the monitoring of man-made objects in space, and the detection, validation, and warning of attack against North America whether by aircraft, missiles, or space vehicles, utilizing mutual support arrangements with other commands. Aerospace control includes providing surveillance and control of Canadian and United States airspace. Also see NORAD Newsroom. North Atlantic Treaty Organisation (NATO) - NATO has been restructured to enable it to participate in the development of cooperative security structures for the whole of Europe. Office of Naval Intelligence (ONI) - U.S. maritime intelligence. ONI employs civilian and military personnel around the world in support of operational commanders and war fighters. Most employees work at the National Maritime Intelligence Center (NMIC) located just outside Washington, D.C.
Royal Air Force (UK) - Official UK site. Royal Navy (UK) - Official UK site. Special Investigation Branch, Royal Military Police - Investigative arm of the Ministry of Defense (Army). Strategic Command - One of the ten Unified Combatant Commands of the United States Department of Defense. USSTRATCOM controls the nuclear weapons assets of the United States military. It is also a globally focused command and a global integrator charged with the missions of Space Operations; Information Operations; Integrated Missile Defense; Global Command and Control; Intelligence, Surveillance and Reconnaissance; Global Strike; Strategic Deterrence; and Combating Weapons of Mass Destruction. It is headquartered at Offutt Air Force Base, Nebraska. Sua Sponte - U.S. Army Airborne Ranger site. History, war stories, pictures, chat. Submarine Warfare Division - U.S. submarine force. U.S. Air Force - Official site. Also see U.S. Air Force Fact Sheets database on weapons, organizations, inventory, careers and equipment. U.S. Air Force Space Command - Coordinates the use of Army, Naval and Air Force space forces. U.S. Air National Guard - A separate reserve component of the United States Air Force. U.S. Army - Official site. U.S. Army Corps of Engineers - Site map. U.S. Army National Guard - Composed primarily of traditional Guardsmen -- civilians who serve their country, state and community on a part-time basis (usually one weekend each month and two weeks during the summer.) Each state, territory and the District of Columbia has its own National Guard, as provided for by the Constitution of the United States. U.S. Army Public Affairs - Official website. U.S. Army Special Operations Command (USASOC) - The mission of the USASOC is to organize, train, educate, man, equip, fund, administer, mobilize, deploy and sustain Army special operations forces to conduct worldwide special operations, across the range of military operations, in support of regional combatant commanders, American ambassadors and other agencies as directed. Army Special Operations Forces or ARSOF consist of Special Forces, Ranger, Special Operations Aviation, Psychological Operations, Civil Affairs, as well as Signal and Combat Service Support units. Special Operations are defined as operations conducted by specially trained, equipped and organized Department of Defense forces against strategic or tactical targets in pursuit of national military, political, economic or psychological objectives. These operations may be conducted during periods of peace or hostilities. U.S. Central Command (CENTCOM) - Headquartered at MacDill Air Force Base, Tampa, Florida. The CENTCOM area of responsibility spans more than 4 million square miles and is populated by more than 550 million people from 22 ethnic groups, speaking 18 languages with hundreds of dialects and confessing multiple religions which transect national borders. The geography of the region consists of the intersection of three continents and globally vital commercial sea lanes, flight corridors, pipelines and overland routes. The 20 nations of the AOR, which stretches from Northeast Africa across the Middle East to Central and South Asia, have forms of governance ranging across the political spectrum, including emerging democracies, hereditary monarchies, autocracies, and Islamist theocratic regime. U.S. Coast Guard - Coast Guard tasks in the maritime aspects of major theater warfare encompass critical elements of naval operations in littoral regions, including port security and safety, military environmental response, maritime interception and coastal se control, and force protection. U.S. Cyber Command (USCYBERCOM) - An armed forces sub-unified command subordinate to United States Strategic Command. The command is located in Fort Meade, Maryland, and centralizes command of cyberspace operations, organizes existing cyber resources and synchronizes defense of U.S. military networks. U.S. Department of Defense (DefenseLINK) - Official web site for the U.S. Department of Defense and the starting point for finding U.S. military information online. U.S. Department of Defense (The Pentagon) - Headquarters of the U.S. Department of Defense. U.S. European Command (EUROCOM) - The area of responsibility (AOR) of the United States European Command covers more than 21 million square miles and includes 93 countries and territories. This territory extends from the North Cape of Norway, through the waters of the Baltic and Mediterranean seas, most of Europe, parts of the Middle East, to the Cape of Good Hope in South Africa. U.S. Forces Korea (USFK) - Refers to the ground, air and naval divisions of the United States armed forces stationed in South Korea. U.S. Joint Force Command (USJFCOM) - Headquartered in Norfolk, Va., U.S. Joint Forces Command is one of nine unified commands in the Department of Defense. It is the only command with both a geographic region and a functional responsibility to support the other four geographic commanders. U.S. Marine Corps - Official U.S. Marine Corps site. Also, U.S. Marines Headquarters. U.S. Marine Corps Forces Reserve - Official site. U.S. National Guard - The National Guard is the organized militia reserved to the states by the Constitution of the United States under Article 1, Section 8. In peacetime, the National Guard is commanded by the governor of each respective state or territory. Also see Wikipedia. U.S. Naval Reserve - Provides mission-capable units and individuals to the Navy, Marine Corps Team throughout the full range of operations from peace to war. The Naval Reserve Force consists of the Ready Reserve, the Standby Reserve and the Retired Reserve numbering over 690,000 men and women. U.S. Navy - Official site of the U.S. Navy. Military Sealift Command (MSC) - Provides on-time logistics, strategic sealift, as well as specialized missions anywhere in the world. U.S. Navy Seals - Official site of the U.S. Navy Seals. U.S. Pacific Command (USPACOM) - The senior commander of U.S. military forces in the Pacific and Indian Ocean areas. U.S. Pacific Fleet - Supports the U.S. Pacific Command's theater strategy, and to provide interoperable, trained and combat-ready naval forces to USPACOM and other U.S. unified commanders. U.S. Special Operations Command (SOCOM) - Official site. Plans, directs, and executes special operations in the conduct of the war on terrorism in order to disrupt, defeat, and destroy terrorist networks threatening the U.S.
U.S. Strategic Command (USSTRATCOM) - USSTRATCOM is the command and control center for U.S. strategic forces and controls military space operations, computer network operations, information operations, strategic warning and intelligence assessments as well as global strategic planning. U.S. Transportation Command (USTRANSCOM) - Coordinating efficent, effective, integrated transportation and strategic mobility for U.S. military. Also see Publications. Unified Combat Commands - Operational control of the U.S. combat forces is assigned to the nation's Unified Combat Commands. The chain of command runs from the President to the Secretary of Defense to the Unified Commanders in Chief. Orders and other communications from the President or Secretary are transmitted through the Chairman of the Joint Chiefs of Staff. A Unified Combatant Command is composed of forces from two or more services, has a broad and continuing mission and is normally organized on a geographical basis. United Nations Peacekeeping Operations - United Nations peacekeepers, wearing distinctive UN blue helmets or berets, are dispatched by the Security Council to implement peace agreements, monitor cease-fires, patrol demilitarized zones, create buffer zones between opposing forces, and put fighting on hold while negotiators seek peaceful solutions to disputes. This webpage last updated on Friday, October 13, 2017 12:56 PM.